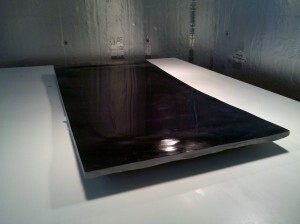 New S14 Coupe Sunroof Delete Mold Operational – Northwind Composites, L.L.C. So an S13 and an S14 coupe share just about everything interchangeably. Suspension, subframes, engines, drivelines, interior bits, etc. So logically one would assume that something such as a sunroof would also be the same right? Nope. They have a different physical size and the contour is notably different. I’ve yet to find out why Nissan has done this. None of the Nissan experts I know can answer this question either. However, that has not stopped us. Thanks to a friendly customer who was willing to exchange a glass assembly for a lightweight carbon delete – Northwind is fully tooled to make a chassis specific S14 coupe carbon sunroof delete. We made a plug using the factory glass and our new mold is now up and running production. Thank you Sebastian for all the help and patience!